This is the greatest time of year. The Holiday season is fully upon us and surely there are more than a handful of you who are sitting around with bellies full of turkey, tasty spirits on the table, board games and laughter filling the air, and plenty of cartoons and toys for the wee ones. But now that Christmas is gone for another spin around the sun, the true meaning of the holiday break can begin: The World Junior Championships. This event is a must-see moment for many and this edition of the Mailbag has some deep roots in the value of this tournament to assess future assets. Answer: Well, I’ve covered my bases a bit by sliding some money down on the Fins (8-1 odds) and the Swedes (6.5-1 odds). This year, the top four are all bunched up with the Russians appearing to be the odd one out from the usual big five. Answer: Rasmus Dahlin is the obvious answer here. He’ll be physically ready and comes with all the pedigree you can handle. The thing is, if I were in charge, I would seriously consider one final year in the SHL for the dynamic left-shot defender to smooth out a few of the decision-making errors that can pop up from time to time with a risk-taking player like he is. Allowing him to correct a few of those mistakes overseas rather than in the NHL on what is surely already a poor team, that will have a fan base screaming for perfection from the new franchise player could be huge for his long-term confidence. Answer: Can I say neither? I don’t think either will produce tangible fantasy results this season unless in very deep leagues. If we’re talking about long-term upside, I see them as very similar players – defensively responsible, strong pivots who likely top out as second line centres who could (and should) compliment a top power play unit. Jost likely comes cheaper due to Patrick’s lofty draft status so he’d be my choice. Answer: I’ll take this to mean I can include undrafted prospects, and that opens up a fun inclusion of Svechnikov, Dahlin and even a kid like Jack Hughes who isn’t coming until 2019. However, for those with far less patience to wait on players, it’s got to be Elias Pettersson at the moment. His blend of patience with the puck, terrific vision and pinpoint accuracy on his shot, make him a threat all over the ice – especially while manning the point on the power play. Pettersson is trampling down a path destined to end with him feeding saucer passes into Brock Boeser’s wheelhouse and from the looks of things, that will be a highly productive spot to be in. Other candidates being: Casey Mittelstadt, Kailer Yamamoto, Eeli Tolvanen, Heiskanen and Aleksi Heponiemi. Answer: I’ll give their realistic upside (some could have a pure ceiling of higher, like Clague, but I doubt he hits it); and then the likely season that they see full-time NHL action. Answer: Technically he’s still a prospect, but not one I’m paying much attention to. His play in the NHL coupled with his mediocre results in the KHL thus far leave me wholly uninterested. The draw was there for the Stars and for fantasy manager: Big, strong, fast and quick hands, but he’s a player that has always left me wanting more and those players often find themselves frustrating coaches even more than fantasy owners. I forecast another attempt at the NHL resulting in maybe a couple of organizations before he heads back overseas for good. I could be wrong and he could cross and be more mature and find early success, but it’s not the result that I’m betting on. Question: “Who’s your top 5 dark horse break out star at juniors? Answer: Janne Kuokkanen is going to turn some heads this tournament. He’s an older player who has been suiting up in the American league for the Hurricanes’ affiliate and doing quite well (3+11=14 points in 19 games as a teenager). Additionally, he’s staring down the barrel of some ultra-sweet deployment centering Eeli Tolvanen and Krisitian Vesalainen at even strength and on the top power play unit. I also think people are really going to fall in love with Robert Thomas – a St Louis first rounder from last June for his consistently smart play and wildly underrated offensive abilities. Joey Anderson is another player whose stock is likely to rise. He’s a 19-year-old who plays a fast and hard-working game. He may not have the big time scoring punch at the next level but he’s the type of player who can find a lot of success in a short tournament like this. Quinton Hughes may not be on everyone’s radar yet as a draft-eligible player but he’s a late 1999 birthdate so he’s already 18 and will likely see his deployment increase for the US squad as the tournament moves along. His skating ability will leave you breathless. Finally, Erik Brännstrom. 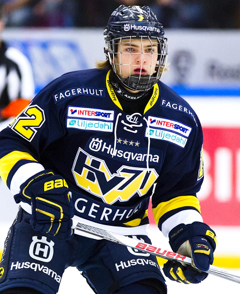 He shouldn’t be a dark horse for anyone, as a top-15 selection last June, but coming from an SHL squad with limited numbers thus far, and on a team with Rasmus Dahlin, and Maple Leafs’ prospect, Timothy Liljegren, Brännstrom isn’t getting nearly the press he should. I believe Brännstrom will solidify himself as one of the best defensive prospects in the world this holiday season. Question: Which offensive defenseman will everyone be more excited for, Clague, Maker or Liljegren. One of these guys is gonna have a great tournament. Answer: Of those players, Makar should be the guy that most people are most excited about. When you see how well this guy can skate, the howitzer he can unleash from the point and his fire-wagon brand of hockey, fantasy owners will be hard pressed not to imagine him lighting up the NHL scoresheet in a few seasons. I believe Liljegren will have a nice tournament as well, as the Swedes should score a lot of goals, but he’ll be stuck on the second power play unit which will be difficult to make a huge splash. That’s all for this month. As always, feel free to follow me on Twitter @CrazyJoeDavola3 where I’m always around to field questions.